The seasonally adjusted mortgage delinquency rate declined 31 basis points during the fourth quarter of 2012, sliding to 7.09%–its lowest point in more than four years. Each of the three delinquency buckets (30, 60, 90+ days past due) registered a lower seasonally adjusted delinquency rate compared to the third quarter of 2012, but mortgages just 30 days overdue experienced the largest decline with a 21 basis point drop to 3.04%. Non-seasonally adjusted 90+ day delinquencies did rise for the first time in more than a year and could lead to a rise in foreclosure activity over the short term, but as of the fourth quarter of 2012 the total foreclosure inventory rate is at its lowest reading (3.74%) since the end of 2008. Foreclosure starts plunged to a share of 0.7% of all first-lien mortgages to close out 2012. Not only is this the lowest reading since the first half of 2007, it also marked the largest quarter-to-quarter decline in the foreclosure starts rate ever recorded for the MBA’s survey. A total of 44 states saw the foreclosure starts rate fall or remain unchanged versus the third quarter of 2012 and only three have a foreclosure starts rate at or above the reading from the fourth quarter of 2011. As has been the case since foreclosures started spiking, overall foreclosure activity remains highly concentrated from a geographic perspective. Indeed, the top 5 states accounted for just above 52% of all loans in foreclosure during the fourth quarter of 2012, with Florida representing 23.7% of the nation’s overall inventory; however, these same five states (Florida, New York, California, New Jersey and Illinois) accounted for less than a third of all serviced loans. In terms of foreclosures started during the fourth quarter, Florida posted the highest among the states (1.34%), followed by Nevada (1.18%). New Jersey’s foreclosure starts rate declined more than 1.2 percentage points between the third and fourth quarters thanks to the diminishing effects of previous legislative efforts imposed to delay the foreclosure process. Existing home sales declined 1% in December, sliding to a seasonally adjusted annualized rate of more than 4.9 million total units. Nonetheless, data from The National Association of Realtors (NAR) indicate sales remain on an upward trend. The average monthly pace recorded during November and December was at its highest level in three years, while sales increased nearly 13% on a year-over-year basis in December. In addition, sales have risen at a double-digit pace in each of the last three months. For the year as a whole, the preliminary estimate increased 9.2% to 4.65 million, marking the highest annual sales volume since 2007. 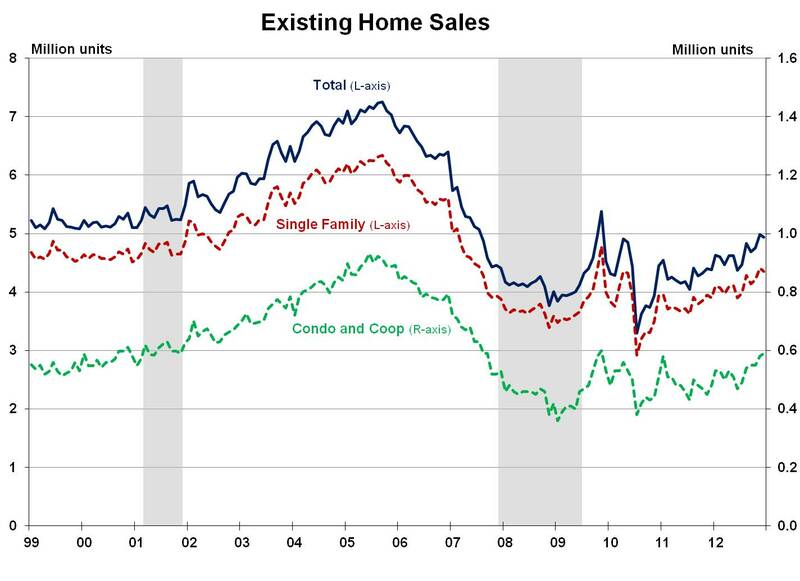 Sales of existing single-family homes fell 1.4% compared to November 2012, dropping to a seasonally adjusted annual rate of 4.35 million units. Despite the slight decline last month, single-family existing home sales are up nearly 12% on a year-over-year basis and for the calendar year as a whole sales averaged roughly 4.13 million units—the largest annual total in 5 years. Condominium and co-op sales increased for the 6th consecutive month in December, rising 1.7% to a pace of 590,000 units, which is the highest monthly reading since late 2009. In addition, sales increased 10.7% during 2012 to a calendar year average of 527,000 units. Existing home inventories shrank further to close out 2012, sliding to 1.82 million units available for sale in December. At the current sales rate, the estimated inventory for December represents 4.4 months of supply, approximately 2 months smaller than December 2011 and the lowest since May 2005. Distressed sales accounted for 24% of the overall sales volume in December 2012 as foreclosures and short sales both represented an identical 12% share of total sales. The median sales price for existing homes of all types increased on a year-over-year basis for the 10th consecutive month during December 2012, rising 11.5% to $180,800. This represents the longest sustained period of growth in median prices since August 2005 to May 2006 and is also the largest percentage increase in more than 7 years. Foreclosure sales sold at an average discount of 17% and short sales fetched a discount of 16%. First-time homebuyers accounted for 30% of existing sales while investors purchased 21% of existing homes sold in December. Approximately 29% of sales went to all-cash buyers in December 2012, a 2 percentage-point decline compared to December 2011. Foreclosure starts declined to 0.9% of all first-lien mortgages during the third quarter of 2012—the lowest reading since the end of 2007. A total of 38 states saw the foreclosure starts rate fall versus the second quarter of 2012 while 39 registered a decline compared to the third quarter of 2011. In terms of the overall geographic concentration, Florida continues to account for nearly a quarter (23.4%) of all mortgage loans in foreclosure and when combined with California, New York, Illinois and New Jersey, these five states accounted for nearly 52% of all foreclosures and less than one-third of all mortgages. New Jersey had the highest rate of foreclosure starts during the quarter due to a large backlog of 90+ day delinquent loans entering the foreclosure process. Arizona and Nevada, states that had foreclosure start rates at least twice the national average as recently as two years ago, are now seeing only slightly above-average rates of new foreclosure activity. The Mortgage Bankers Association’s National Delinquency Survey showed the (seasonally adjusted) overall delinquency rate on first-lien residential mortgages fell to 7.4% during the first quarter of 2012. According to the release, the 30-days late delinquency bucket saw its delinquency rate decline to its lowest reading in 5 years and is now on par with normal levels. The 60-day delinquency bucket saw a similarly large decline during the first quarter, while loans more than 90 days overdue (3.05%) dropped to late-2008 levels. Seriously delinquent loans, i.e. those 90+ days overdue or in the foreclosure process, as a share of all mortgages declined 29 basis points to 7.44%. Foreclosure inventories nationwide ticked slightly higher last month due to rising foreclosures among prime and FHA loans. By contrast, subprime loans are accounting for a smaller share of mortgage foreclosures as the non-performing loans have generally been resolved through the foreclosure or loan modification process already. Geographically, the improvement in loan performance during the first quarter was fairly widespread. The foreclosure start rate declined in 41 states and only 7 (Washington, Oregon, New York, New Jersey, New Mexico, Maryland and Arkansas) saw their share of seriously delinquent loans increase versus the fourth quarter of 2011. Florida remained the epicenter of the nation’s foreclosure inventory, accounting for nearly a quarter of the national total, and also possessed the highest foreclosure start rate during the first three months of 2012 (1.73%). Overall, five states—Florida, California, Illinois, New York and New Jersey—account for 52% of the national foreclosure inventory, but represent less than 32% of all serviced loans in the U.S.. The Mortgage Bankers Association’s National Delinquency Survey showed the delinquency rate on first-lien residential mortgages dropped 41 basis points to 7.58% during the fourth quarter of 2011 (down from 7.99%). While the foreclosure inventory remained elevated from a historical perspective to close out the calendar year, it still registered a modest decline between the third and fourth quarters of 2011, falling 5 basis points to 4.38%. The share of loans entering the foreclosure process during the final three months of the year slipped to 0.99%–marking only the second time in the past four years the foreclosure starts rate fell below 1%. A promising piece of data in last quarter’s results was the broad-based geographic improvement in mortgage loan performance. The share of seriously delinquent loans remained unchanged or fell in 25 states, including the hardest-hit areas of California, Florida, Nevada and Arizona. While this represents an improvement, the foreclosure crisis still very much remains concentrated geographically as five states—Florida, California, Illinois, New York and New Jersey—account for more than half of all foreclosures yet only represent less than a third of all serviced loans. By itself, Florida accounts for nearly 25% of the nation’s total foreclosure inventory. The legal process has had a palpable effect on the level and trajectory of foreclosure activity across states. Indeed, of the top 15 states in terms of the current share of first lien mortgages in foreclosure, 14 use the judicial process to handle foreclosure cases. Furthermore, foreclosure inventory rates in judicial states are roughly four percentage points higher and have seen rates trend appreciably higher while non-judicial process states have experienced modest declines in foreclosure rates during the past two years. The Mortgage Bankers Association’s National Delinquency Survey revealed a 45 basis point decline in the share of delinquent loans (from 8.44% down to 7.99%) during the third quarter of 2011. This marks the lowest reading for loan delinquencies as a share of total loans outstanding in nearly three years. However, the share of mortgage loans in the foreclosure process remained unchanged at 4.43% while the foreclosure start rate increased 12 basis points to 1.08%. The proportion of loans in the 30-, 60- and 90+ day delinquency buckets all declined from the previous quarter. In fact, the share of mortgages 30 days overdue slipped to its lowest point since the first half of 2007, while the 90+ day overdue bucket registered its lowest reading since the fourth quarter of 2008. Loans 90 days or more past due are particularly important indicator for foreclosure activity since these mortgages are the least likely to become current (via modification or some other procedure) and can generate an immediate notice of foreclosure from the loan’s servicer. With a smaller share of loans at this stage, as well as the declining share of mortgages less than 90 days overdue, the foreclosure pipeline is being worked off. The worst of the foreclosure crisis remains centralized in a few key states. Indeed, the top five states contain nearly 53% of the foreclosure inventory yet account for less than one third of all serviced loans. Florida accounts for nearly one-fourth of all mortgage loans in foreclosure and approximately 14.5% of the state’s loan inventory has entered foreclosure. Florida is one of many states wherein the judicial system guides the foreclosure process, and these states have seen foreclosure inventory rates trend higher over the past year due to a growing backlog of foreclosure cases slowing down the courts. Meanwhile, those states that do not have a judicial process have had foreclosure inventories trend lower for nearly the past two years. In terms of foreclosures started during the third quarter of 2011, Nevada posted the highest start rate (2.48%) followed by Florida (1.96%), Arizona (1.67%), Rhode Island (1.66%) and California (1.45%).